No, not only a Faithless song. 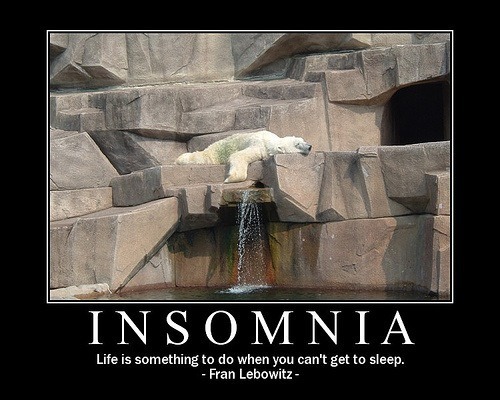 Insomnia seems to become part of my reality, as if my body REALLY enjoyedwaking up at 3:54 and thinking: Sleep? That old thing? NAAAAAAH I’m well off without it. Thing is, Body, Spirit or Mind, my inner soul would LOVE some sleep, would actually cherish every moment of it. Sometimes, I just feel like saying, Ok, Good Night everyone, that’s enough life for me for today, bring the oblivion please. Which would last for about 2 hours. And then, I’m SUPER awake, more awake than I’ve ever felt, I’m so awake that I start organising my life, go over conversations, thoughts and feelings and fears going round and round in my head, until sleep is no longer an option. It seems that nowadays I have to sort out my life between 3:54 and 6:40. Then I drift off. Then my alarm rings, at 6:45. Then I REALLY want a cigarette. Yes, at 6:45. I’ll probably become one of those older Arab women who drink their coffee and smoke their cigarettes from their bed before even stepping out of it, screaming orders at the top my lungs (or what’s left of them) with a raspy voice. Anyway, so what do I do when I can’t sleep? First I toss, then I turn, then keep looking for a fresh part in my bed or on my pillow. Emotional elevators tend to come at around 5:00, when I’m done with practicalities. I agonise over mundane things that seem too small to even notice in broad daylight. When I get to accepting the fact than there will be no sleeping for me anymore, I simply decide to live with it, and check what I could do. This is usually when novels are finished (both mine and other people’s), blogs are read (especially this one, product of another Sleepless Soul), lists are made, life is organised. When I was younger, my Sleepless company was Fiona Apple. I’ve listened to When the Pawn over a hundred times when I was 16, waiting for her (raspy) voice to nurse me to sleep. Now I just plug Shadi Zaqtan in my ears and go on about my business, my insomnia nicely taken care of with a lovely soundtrack to go with it. Right, so I have a slight tendency to be obsessive. Like, when I was 12 and had just discovered Oasis, I decided that I will be in love with Liam Gallagher for all eternity and that I had to listen to “What’s the Story? Morning Glory” two thousand times before my mother threathened to destroy my CD player and, just to be on the safe side,to go to Manchester to kill aformentionned beloved Liam so she wouldn’t have to listen to another “because maybeeeeeeeeeeeeeeeee you’re gonna be the one that saves meeeeeeeeee” one more time. That’s how bad I was. And please don’t get me started on my Bob Dylan phase. I wanted to reverse time and become Suze Rotolo so that I could be the one on the Freewheelin’ Bob Dylan cover. See, I told you. Obsessive. Alas! Time has not made any improvment to my disorder, and I’m happily as obsessive as ever, except maybe now I’ve come to terms with the fact that I don’t necessarily need to be in love with a musician to listen to the same record over and over and over again. And then a bit more. I’m not a teenager anymore (Thanks Jesus Christ and all his angels and all his saints for good measure, Hell must be a pleasant place next to living with teenage angst, but that’s not our current point). It usually takes me a while before full fledged obsession kicks in. I usually start off being quite normal, like, ooohh nice song I like it. Then, if the song is really good, something happens. Exhibit1 : First time I listened to Wonderwall, I was like, boy this Mancunian needs a hair cut. Then something in Liam’s electric voice triggered something inside of me, a sadness, a melancholy (yes, more teenage angst) and I was as good as done. Exhibit2: First Bob Dylan song: All I really want to do, I really thought this had to be a joke. Somebody who sang so out of key probably needed to be a genius. And what a genius. Bob’s still my friend for the nights when I can’t sleep, I don’t even need to play his records, my brain’s has recorded them all. So first time I listened to Shadi Zaqatan and Friends, I enjoyed their music, thought the lyrics were deep, moving, interesting. But that was about it really. Then, one day, I just paid a little more attention to one song in particular, Bshoufek fil Balad, and that’s when it happened. The lyrics, Zaqatan’s voice, so deep and pure, the song transformed into a love letter, an aching one, a one where you wanted so badly to talk to the person but simply couldn’t. I’ve been listening non stop to the record for two days in a row now, and have no plans in stopping. The songs speak to me now, to some hidden chord inside of me that understands the love for one’s land, the anger and the hope. My obsession and I are old friends now, we’re like an old couple, too into one another for me to be wanting to get rid of it. Sharing with you one of my favourite Palestinian singer, Shadi Zaqtan, have a lovely day! !